Welcome to our second lesson! 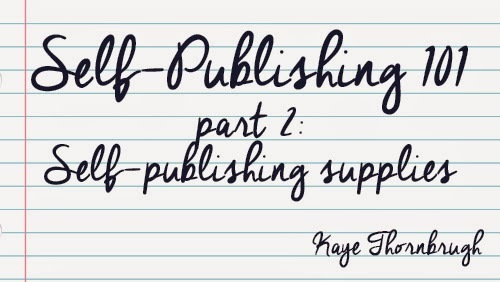 This week, we’re going to discuss how to prepare your book for publication. I know this seems like a no-brainer, but for my own peace of mind, I want to remind you to make sure that your manuscript is polished and error-free before you publish. Writers aren’t the best judges of their own work. That’s just the way it is. You need objective opinions on your novel. Find some critique partners to read your manuscript, and when they’ve looked it over and given their comments, hire a professional editor to go through it. Your book will be better for it, and your future readers will thank you! This is something you can farm out to a professional or charitable family member, if you’re so inclined, but I’ve never done that, so I’d like to share how I tackle ebooks. I format my ebooks based on the Smashwords Style Guide, which is available to download for free. Don’t be daunted by the long PDF. The process is fairly straightforward. If you’re reasonably handy with Microsoft Word and follow the directions exactly, you’ll have a well-formatted ebook in no time. Once you format one ebook successfully, every other formatting session will feel like a breeze! Personally, I can format an ebook in a day or two, once I get into the rhythm. Catherine Ryan Howard has also written an excellent post on how to format your ebook. Get thee to her blog! Lastly, Scrivener has the ability to convert your manuscript to a number of ebook formats. Though I’m writing Lights (Flicker #3) in Scrivener and couldn’t be happier with the program, I haven’t used the ebook conversion feature yet, so I can’t speak to it personally. However, all the authors I know who’ve used it have been very satisfied with the results, so if you use Scrivener, I think it’s worth a try. If you haven’t heard of Scrivener, then you are late to the party, my friend. Put simply, Scrivener is a program designed for writing novels (or any other long work, like a screenplay or an academic paper). Just go to their website and check it out. Pro Tip: When your ebook is formatted, load it onto your ereader of choice and read it from beginning to end. (If you don’t have an ereader, you can download the free Kindle app for your computer and read your ebook that way.) This is the best way to make sure your formatting is perfect, and it’s also a great way to see your book with a fresh set of eyes—more like a reader’s eyes than a writer’s. Oddly enough, reading my books on my Kindle helps me weed out those last few typos that manage escape my previous rounds of editing. imagination, or the author has used them fictitiously. 02) Links to Other Books and Blurbs: If you have more than one book published, be sure to include links to your other titles. Some authors put these links at the back of their books; I put mine at the front, after the copyright notice. I just go with a simple “Other Books by Kaye Thornbrugh,” with a hyperlinked title listed underneath. Also, you might want to include some “blurbs” for your book—that is, short quotations from positive reviews. I blurbed a few reviews of Flicker at the beginning of the Brightly ebook. If you decide to include some blurbs, the key thing is to keep it brief. You don’t want to bog readers down in reviews, so choose only a handful of brief, punchy quotations. 03) Author Info: Your author bio and all your links (website, Facebook, Twitter, email address, etc.) will go at the end of your ebook. This makes it easy for your readers to connect with you online. 04) Call to Action: Include this at the end of your book. The best time to get your readers to post a review (or sign up for your mailing list, or do anything like that) is right after they’ve finished your book, while they’re in awe of that fantastic ending. 05) Dedication and Acknowledgments: These are both optional, but I think it’s better to include them than not. Writing the acknowledgments is one of my favorite parts of publishing a book, because it’s my chance to thank all the people who have helped me along the way. It also means that I’m pretty much finished with my current book, so getting started on my acknowledgments always gives me a bit of a boost! I recommend printing your books through CreateSpace. When I first published Flicker, I went through Lulu, but switched to CreateSpace within a few months. It’s much cheaper to print with CreateSpace, for one thing, and the quality of the books is very high. I also like the interior review feature on their website that lets you view your book as if it’s already printed, two pages at a time. Also, CreateSpace now offers matte covers, so your paperbacks will look better than ever. I still haven’t stopped mooning over my matte copies of Flicker. As for the actual formatting process, the best program for putting together a printed book is Adobe InDesign. Now, fair warning: Because of my work as the editor of a college newspaper, I’m an expert with InDesign. My newspaper design knowledge translated pretty easily into paperback design, so I’m able to format my own paperbacks without trouble. However, I recognize that most people don’t have that kind of experience, or access to InDesign, which is a pretty pricey program. While it is possible to use Microsoft Word to format a printed book, I don’t recommend it. Microsoft Word just doesn’t have the capability to format your book the way you want—that is, to format your book so it’s beautiful and stands up to the other books on your shelves. If you don’t have the ability to format your paperback, you’ll have to hire someone else to do it. As always, make sure your designer has references and samples of their previous work, so you can make sure you’re hiring the best possible person. NEXT WEEK: Creating a cover that will sell books!